I agree that it was somewhat balanced, for a 30-second documentary… I think NZ main-stream-media (msm) has a long way to go, but at least it wasn’t just 30 seconds of a solo alarmist rant by a wonky ex-NIWA wonk. Maybe times are a-changing, but I am yet to be convinced of the commitment from msm to balance. I have presented my election manifesto to the assembled at The Daily Blog. It doesn’t seem to be getting a lot of support, although one commenter loves me, apparently. Last night’s TV3 news item on Jim Salinger’s findings considered it necessary before closing to offer the opinions of climate change denial propagandist Bryan Leyland that the temperature was always going up and down and that sunspots were a likely reason. I shot off a complaint. It’s depressing that at this stage of scientific understanding TV3 should still be seeking out deniers like Leyland and putting them on the same level as genuine scientists. Of course it is fine for Bryan Walker, an ex school teacher and lay preacher, to pen articles in the Waikato Times on climate change, but that is a different issue. He is representing “the science”, although Bryan Leyland’s views can also be backed up by peer-reviewed science, but that is a different issue too. Good luck wight the TV3 complaint Bryan. I don’t understand why they don’t like your ideas Andy! They seem perfectly in line with the bulk of the other comments, except without all the bilious vitriol. I saw that. Tell them you’re Irish African, with a hint of amazonian rainforest. ‘MR Golly’. Now you’re just being sexist as well Andy. Have you no shame? I wasn’t me calling it “Mr Golly”, it was the patriarchal sales-person who was imposing her gender-sterotyping on me. Now I am a victim of these outdated colonialist views being forced upon me. The first two items (stop oil drilling and coal mining) are in the Green party manifesto. The rest – well I’m not really sure what they want because no one ever says. It’s a secret – hush hush. We need to “take action on climate change”. Just don’t tell anyone what that “action” might actually consist of. Heaven forbid it might actually make people’s lives more difficult. Does anyone know the status of the nzcet settlement? There are accusations at Hot Topic and the media that they have defaulted on the payments. True or false? Clearly not funded by Big Oil…. Yeah right. ‘Confidential sources’ is probably Heartland which is ExxonMobil and other sources. If that is not the case then the Trustees should publicly state what their funding sources are. It’s ironic that those that go on about wastage of tax-payers money are not prepared to stump up when they personally waste a rather large dollop of it. Would it have been a waste if justice had actually been served Simon? Their ‘Statistical Audit’ (evidence) was dismissed out-of-hand by Venning. Sad day for NZ when evidence is not allowed in court. NEW YORK (MarketWatch) — Exxon Mobil Corp. has cut funding to groups raising questions about climate change from human-generated carbon dioxide, announced ahead of its annual meeting Wednesday amid criticism that the oil giant isn’t as green as some of its rivals. Spokesman Gantt Walton confirmed Tuesday that in 2008, Exxon Mobil scrapped funding for the Capital Research Center, the Committee for a Constructive Tomorrow, the Frontiers of Freedom Institute, the George C. Marshall Institute and the Institute for Energy Research. Morgan said he “suspected the judge [did that because] he think the merits of their accusations way below a basic threshold”. Apart from Stuff’s below basic threshold copy, it was the judge that reduced the NZCSET case below threshold in the first instance – not the Trust. He gutted the merits of the case – no ‘Statistical Audit’, no case basically. Morgan’s got a nerve to make a false statement like that. As I have tried to explain repeatedly, a court of law is not able to determine scientific fact. It can only come to a decision based on the balance of evidence. The country’s chief metereologist has far higher weighting than a retired geologist and a junior engineer, neither of whom are experts in the field. A prolix submission doesn’t help either. The evidence for warming is conclusive despite there being more uncertainty over 19th century temperatre records. >”….based on the balance of evidence. Exactly. Thank you SimonP. Where was the balance? J Veening didn’t consider the major component of the NZCSET’s case (the ‘Statistical Audit’) on it’s merits irrespective of the Judge’s inability to determine validity of either methodology, NIWA’s vs NZCSET’s, i.e. he didn’t actually look at the “facts” in the first instance. “chief metereologist”? “retired geologist”? “junior engineer”? Who are these, and what are you smoking? >”…neither of whom are experts in the field.” The NZCSET “Statistical Audit” was reviewed by 3 professional statisticians i.e. “experts in the field” of statistical methodology. NIWA’s Dr Mullen, on whose word J Venning relied solely (i.e. no “balance of evidence” there then) , is NOT a statistical specialist or expert statistician. The case was in respect to the 20th century not the 19th. The NZCSET found 0.34 C/century warming over the period of the 7SS 1909 – 2010 using rigpurous application of R&S93 methodology vs NIWA’s 0.91 C/century using loose, arbitrary and indeterminant methodology i.e. no dispute over warming during the 20th century (none in the 7SS in the 21st though by either method). What’s your choice of science Simon, rigourous or loose? Further, I note that Mr Dunleavy has, in any event, failed to comply with High Court Rule 9.43, and could not be regarded as an impartial expert. There are passages of his evidence which are objectionable on the grounds that they are submission and not evidence as to factual matters or even opinion. Mr Dedekind suggests that in all material respects the methodology of the review is unchanged from the thesis. Dr Carter also considers that the statistical comparison techniques used in the thesis to be very similar to those described in the review and refers to a table to support this point. However, Dr Wratt does not accept this and explains the differences between the review methodology and the thesis in his evidence. He says the 2010 NIWA review methodology was a step forward from that utilised by Salinger for his thesis work. Dr Wratt identifies a number of errors in the table relied on by Dr Carter. He also answers Mr Dunleavy’s reliance on an earlier letter and says the review project was established to review the site change adjustments by independently recalculating them based on consideration of the underlying data and metadata. Mr Dunleavy was neither an author nor reviewer of the ‘Statistical Audit’ that was dismissed. Exactly the reason why the ‘Statistical Audit’ was sent to professional statistical reviewers and changes made according to their reports. J Venning made NO recognition of this. And I repeat, what makes Dr Mullen an “expert” in “the application of statistical techniques in the field of climate science”? In respect to the methodology applied by NZCSET (R&S93) or the indeterminate thesis variation, Mullen, or any other NIWA scientist for that matter, DIDN’T APPLY R&S93 anyway. They just loosely followed a thesis or some variation of it (as if that’s established science). Dedekind, the other authors and professional reviewers, DID APPLY R&S93 rigourously. Yes, it’s JUST A THESIS, not peer-reviewed literature as R&S93 is. And an arbitrary and indeterminate variation of it (the thesis) to boot. Dr Wratt has NOT DISCLOSED “the 2010 NIWA review methodology” i.e. NIWA’s methodology basis established in climate science and statistics (because there isn’t any). What differences can be identified between the Salinger thesis and “the 2010 NIWA review methodology” (whatever that is) if “the 2010 NIWA review methodology” is NOT a replicable technique? I would point out that BOM has NOT used NIWA’s methodology in the ACORN-SAT series i.e. NIWA is using outdated statistical break-point methods anyway. BOM discards adjustments of less than 0.3 C, plenty of those in both NIWA’s and NZCSET 7SS. I am interested to know whether there is any intention to pay these costs. I am withholding judgement since there is only the word of a single Sunday Star Times journalist on this so far. Makes me wonder why a hearing was allowed by the court in the first place if there were questions over the claimant’s ability to pay in the event of costs being awarded against them. Which in turn raises the question of how public bodies are to be held accountable by citizens if the weight of a public corporate body holds sway over the court at the (considerable) expense of the citizens who take a case to court. Or in other words, if the NZCSET was a publically funded body like NIWA then the costs could be readily paid. It wasn’t, so makes sense to position itself similar to a limited liability company because the court’s not impartial in citizens vs public corporate as NZCSET v NIWA shows clearly. This is exactly why shareholders are shielded from company liability by the limited liability structure where liability gets added to liability. The court must have known the Trust was effectively a limited liability structure from the outset. You would imagine that they might have run that past themselves before starting these proceedings. Seems like basic due diligence to me. NIWA have not defined “the 2010 NIWA review methodology”. The correct R&S neighbouring stations comparison approach is to use monthly data, and cover just two years pre and post. This essentially uses the differences between 12- and 24-months of data respectively, which is an adequate set of values for the purpose at hand. If there is a genuine shift in temperatures due to a station change, the shift should be obvious in the monthly data when comparing one or two years before and after. That R&S93 technique is replicable by anyone with enough statistical ability to apply it to raw data. What NIWA technique would the same applier use to replicate the NIWA series given just raw data? That’s what I’m getting at. I’m sure they did, and with the prospect of inordinate costs being thrown back at them opted for a limited liability structure effectively. That’s simply sensible and what Ltd companies have been doing legally since 17th century. It was the court that neglected due diligence. One look at the NZCSET statement of financial position (or whatever the trust equivalent is) would have told them it was in no financial position to pay the amount of costs that could be expected if the ruling went against them. But if they don’t “the Registrar may take this as an indication that the society has ceased operations and will begin to take steps to dissolve the society (remove it from the register)”. In any case the court could have asked to see the financial statement anyway. It wasn’t as if the court didn’t know “T” was a trust. About to check when I saw your clarification, thanks. The question remains though, does a trust’s financial statement showing insufficient funds to pay costs in the event of an adverse ruling, preclude court action (merely the hearing of a statement of claim, not a suit in this case – see below) if due diligence turns up the inadequacy of funding? If so, this would cut off recourse to justice by a good many societies, trusts, private individuals and such like seeking similar hearings. The threshold for having a claim heard would be a financial position of around $100,000 of liquid assets. Anyone with less than that is shut out. We have to remember too, this was the hearing of a complaint (statement of claim), not a suit or whatever. Sometimes, the Environment Court may be asked by the respondent to an appeal to make an order securing costs before allowing an appeal to be heard. This may be requested if it’s suspected that the person bringing the appeal may not have sufficient financial resources to pay costs should their appeal be unsuccessful. Going by the RMA advise, the coalition should have formed a society because a charitable trust “does not limit liability in the same way as an incorporated society, as trustees can be personally liable for actions they take in the trusts name”. The RMA advise also to make evidence “concise and to the point” in order to minimise the risk of costs being awarded. The NZCSET trustees got these two vital aspects wrong IMO (latter most disappointing), But on the other hand I don’t recall NIWA asking for an order securing costs either. Without that order, what if the trustees assets are in turn trusts? It would take a trust-breaking exercise to extract the costs. I was very disappointed the case was not concise and to the point (“prolix” instead), the ‘Statistical Audit’ should have been front-and-centre IMV, After which I can’t say I’m all that interested in the personal financial structuring of trustees assets or trust vs society. That was their risk. If they have to pay up because they got that wrong, so be it. I will agree that inclusion of T Dunleavy’s evidence and promotion of him as an expert witness was ill conceived. This was a major strategic and tactical error on the part of the coalition IMV. How they thought T Dunleavy would be considered by the court to be an expert witness is beyond me. This was the “unnecessarily prolix” stuff that lost the case for the coalition I’m sure. It had the effect of deflecting attention from the central thrust of the case where NZCSET went head-to-head with NIWA (‘Statistical Audit’ vs ‘Review’). Which case, after the dismissal of the Audit by the Judge, was really no case at all. But Dedekind and the ‘Statistical Audit’ is another matter entirely to Dunleavy. Note that it (the Audit) still stands i.e. it has not gone away just because the court decision went against NSCSET. The original NIWA Review did not appear in a journal and since the ‘Statistical Audit’ is an audit of it there is no necessity for the Audit to appear in a journal either (for it to be considered in conjunction with the original Review in a scientific sense). There was a lot of work went into the Audit. Dedekind and co-authors were obviously equally able to statistically apply R&S93 to the raw CliFlo data as Dr Mullen was (not that Mullen did), irrespective of the judges opinion of that (i.e. it was done and can be proved to have been done simply by referring to the Audit). In any case, the author’s work was reviewed by professional statisticians. That work was wasted by strategic and tactical errors on the part of the coalition heads. But what if the Audit in modified form does appear in a journal? That’s still not inconceivable. Not necessarily a climate journal either, break-point analysis is a statistical technique not at all reserved for temperature time series but common to other applications e.g. “The method used for statistical detection (but not adjustment) of potential inhomogeneities in the ACORN-SAT data set broadly follows the method used by Menne and Williams (2009) for the continental United States, to which readers are referred for a full description. Details of the implementation of the method in the Australian context, and of deviations from the original method, are described in the following paragraphs. Menne, M.J. and Williams, C.N. 2009. Homogenization of temperature series via pairwise comparisons. J. Clim., 22, 1700-1717. NZCSET cite their method to be Rhoades and Salinger (1993). You would think that a charitable trust would ask for donations from the general public prior to being forcibly liquidated. The trustees have in the past stated their dislike for the waste of taxpayers’ money. They are independently wealthy people so I am sure they will pay up rather than abdicating their financial responsibilities. Well if they don’t the guys at Hot Topic are queuing up to find a private prosecution. Of course, this could all be a non story and the monies will be paid in time. After all, not everyone.has six figures to pony up overnight. Probably still do. It’s the over-hyping of man-made climate change and the waste of taxpayers’ money as a result of it that is at the root of the coalition highlighting NIWA’s part in that. Their 0.91 C/century NZ warming is baloney as a rigourous application of R&S93 demonstrates with 0.34 C/century. It was never a waste to take action because there was key evidence developed (‘Statistical Audit’) even though that was dismissed out-of-hand (was that justice Simon? ), the waste by NZCSET was strategic and tactical in presenting the details of the claim. However, as I’ve also said to SimonP up-thread, a lot of work went in to the ‘Statistical Audit’, it was reviewed by statisticians, and it hasn’t gone away just because a judge ruled against other aspects of the claim rather than address it. NIWA still have that Sword of Damocles hanging over them in the scientific arena. NIWA have no replicable basis to cite for their 0.91 C/century. If that is what comes out of NZCSET v NIWA then that’s a revelation and the greater waste is the cover-up of that thanks to the court’s inability to address the evidence. The ONE BIG PROBLEM for NIWA and BBC is that there is no longer any warming happening anywhere this century. let alone man-made warming. “There’s more energy and moisture in the air and water, so yes we expect climate extremes like high rainfall and winds will increase in frequency as the globe warms. “The outcome for the future is that, especially for the north and the east of New Zealand, it’s going to become quite a lot more droughty quite a lot more often.” But while the “exceptional” weather events could be partly attributed to climate change, some were simply a normal by-product of living in an island country. Never mind that the global metrics aren’t exhibiting any warmest ever 2013 i.e. “as the globe warms” isn’t. 13.4 2013 <= global warming turned up here for some inexplicable reason. It wasn’t a waste of taxpayers money though. It showed the public of New Zealand and the scientific community around the world that NIWA can’t produce the method they used so that their findings can be replicated. As a result, NIWA’s name is now mud in the eyes of the public and they are assumed to be either lying or incompetent – the BOM wouldn’t even back them up, and rightly so. Fancy not knowing what scientific method they used. If they do know but refuse to say so then they have something to hide. The court case exposed NIWA as a ‘scientific’ institution that is so afraid of it’s own working methods (if they have one) that they don’t want anyone to know what they are. In other words, their findings are dubious, can’t be replicated, and are not to be trusted. I think the court case was very successful in this respect, and the citing and ridicule of NIWA’s lack of scientific method will continue until they explain themselves. Except there is one big problem. The 0.3C/century calculated by NZCSET is difficult to reconcile with the rest of the south Pacific which has warmed by about a degree. Perhaps the period of comparison is important? NZCSET used only 1-2 years but Dr Wratt suggested that using the longest possible time period provided there has been no environmental changes between the stations. Don’t know how if a “Beddoe Order” is applicable in NZ (I would think it is) but the NZCSET trustees commenced their action “without the sanction of the Court”. If the trustees have Beddoe Order type indemnity then they have no liability for costs. If the trustees have no Beddoe Order type indemnity then they’re liable for costs. Can you please show me where I can find the temperature data for the South Pacific region showing 1C? Many thanks. If by South Pacific you mean as a whole, wouldn’t the NZ temperature have a strong influence on this, i.e. if the NZ temp was lowered to 0.3C/century as shown by NZCET wouldn’t this lower the overall temperature of the South Pacific due to the sparse temperature readings? Why does trend and absolute have to be reconciled (it can’t anyway – see below)? The technique has been established, NZCSET followed it, and the trend was 0.34 C/century. NZ and Western South Pacific warming (about 0.7 – 0.8 C but questionable, not 1 C BTW) occurred from early 1950s to late 1970s. That 25 yr period of absolute warming doesn’t mean the 0.7 – 0.8 C absolute rise is translated to the trend of an entire century of data. 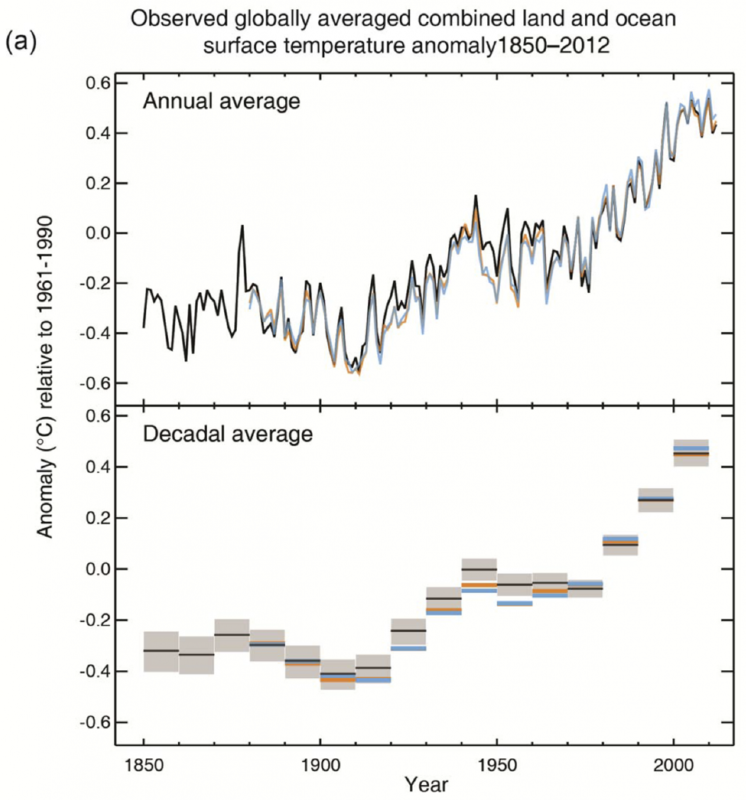 In fact, the 100 yr trend should be considerably less than the 20 yr absolute rise, as 0.34 C/century is. In other words, the 0.34 C/century trend reconciles with 0.7 – 0.8 C absolute warming that only occurred over 20 yrs in the middle of the century. There was initial cooling prior to the 1950s and very little warming after the 1970s. Certainly is important. R&S93 (and BOM’s and NOAA/NCDC’s M&W09) stipulates MONTHLY data and R&S93 the difference between 1 and 2 years either side of a break-point i.e. 2 yrs of monthly data is 48 datapoints. NZCSET conformed to R&S93, NIWA did not. They used ANNUAL data which for 2 yrs is 4 datapoints or for the longest they used (11 yrs) is 22 data points, monthly provides the most data for correlation. M&W09 also use Max/Min data. The R&S method is explained in more detail in Appendix A.  No evidence of significance tests – adjustments are always applied. See Appendix B for further comments on the NIWA method. This region comprises a large southern area including Campbell Island (53°S) in the south, New Zealand, Chatham Islands (44°S, 176°W) to the east, and as far north as Nuku’ alofa (21 °S) in southern Tonga. Most of the area is influenced by the southern latitude 94 M.J. Salinger / Atmospheric Research 37 (1995) 87-99 westerlies and subtropical anticyclonic belt. Mean temperatures increase sharply in this region, amounting to a significant warming of 0.77°C (Table 1 and Fig. 2) from 1941- 1990. BEST Oceania includes Australia. NIWA’s latest 2013 annual mean is 13.4 C, BEST latest was at about 22.9 C and moving average at 22.2 C i.e. not representative of NZ environs in the South Pacific. 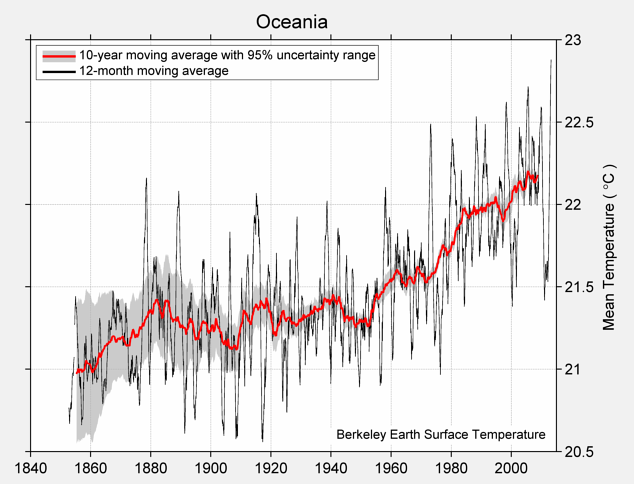 Worse, BEST’s largest warming jump occurs AFTER the late 1970s right through to 2010. 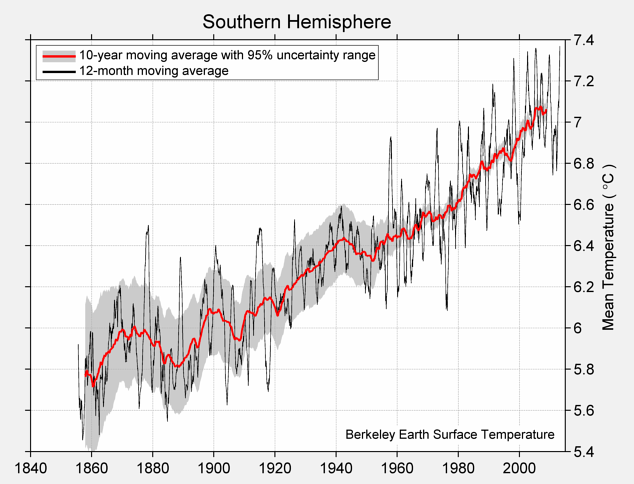 This is completely at odds with Salinger and Mullen (1999) and Salinger (1995) above who find the South Pacific (SP) warming jump occurred BEFORE the late 1970s. That’s clear in the 7SS graph whether NIWA or NZCSET. Again, same as for not translating absolute rise to trend, you cannot translate 7SS warming that was most pronounced over only early 1950s – late 1970s (0.77 C absolute NZ region T3, 1.54 °C / Century, 0.43 C absolute SP region T2, 0.86 °C / Century – Salinger 1996) to BEST warming for a different region that was most pronounced 1950 – 2010 (0.85 C absolute, 1.38 °C / Century). Looks nothing like the South Pacific and New Zealand but does look like BEST Oceania. All BEST have done is smeared Australia over the rest of Oceania including NZ and the Islands. In reality the warming jump was only over 2.5 decades 1950s – 1970s which works out at 3 C/century and 1.72 C/century respectively. Obviously just silly to translate a 2.5 decade jump to 5 decades and then to 10 decades in this way when the rest of the data is not on that trend. No. We don’t. And “access to justice” is a real problem. If it wasn’t a legal issue or was vexatious the hearing would never have been allowed in the first place. The court decided the case should be heard after statement of claim was made. That issue was not resolved satisfactorily by the court (it could have been) and is still open in the statistical/scientific arena for which NiWA has no answer. Geddis leaves out the bit that because NIWA refused to tell NZCSET what its methods were, and was very obstructive at every request for information, NZCSET had no option but to seek court redress. He also leaves out the costs and time incurred by the group in researching and auditing NIWA methods. Therefore Geddis skews the argument so that it looks like a frivolous and vexatious action. Further, the title of the piece is “Debts and Lies are Generally Mixed Together” yet Geddis does not expound on this title one bit. Simply raising questions about the morality of setting up a trust before taking the matter to court does not provide evidence of falsehood. So he exaggerates by implication, and exaggeration is the quickest way to lose an argument. Comment RT? You know you want to. Maybe you could elucidate on the linkages with the International Climate Science Coalition and the names of the reviewers who ‘validated’ the NZCSET calculations. Are you implying by your scary quotes that the ‘Statistical Audit of the NIWA 7-Station Review’ is invalid statistically Simon? If so, please detail WHY it is invalid. Or shut up if you can’t. I was wondering why the reviewers did not pick up on those errors. Odd that they did isn’t it given science is about replication and the Trust followed Rhoades and Salinger (1993) faithfully (the established, published, methodology for that series of which Salinger was co-author but Rhoades, not Salinger, was the statistician)? Interesting. The Trust apparently, according to Salinger, made “lots of errors” applying the methodology of Rhoades and Salinger but NIWA didn’t? Just what EXACTLY were those errors? According to Jim there were “lots” so it shouldn’t be difficult to find documentation of what SPECIFICALLY those “errors” were should it Simon? If you can’t produce anything yourself perhaps you could contact Jim Salinger personally and ask him for the details. He’s at University of Auckland School of Environment. I’m sure they’ll give you his contact email. The reason for that is quite simple. The “errors” the Trust made were to apply R&S93 rigourously. NIWA’s interpretation and application on the other hand was loose and arbitrary as it suited them. The reviewers therefore would not have been working to statistical criteria where rigour is error. Shouldn’t whoever did the analysis have contacted Salinger early on to ensure that their understanding of the methodology was correct? That’s what most scientists do if they can not reproduce results or if there is ambiguity. Salinger said that he was never contacted. The reason for the Trust not reproducing NIWA’s results was because NIWA’s interpretation and application was at odds with the established methodology (R&S93) in an inconsistent arbitrary way Simon. So how can it be replicated? The Trust just applied Rhoades and Salinger methodology. It’s perfectly clear and detailed in the ‘Statistical Audit’ Appendix. There is no “ambiguity” in R&S93 and no need whatsoever to get any clarification from Salinger, he already made the method perfectly clear in R&S93. R&S93 (and M&W09 for BOM ACORN-SAT) stipulates NEIGHBOURING stations for comparison, NIWA used REMOTE stations. Salinger, Wratt, Morgan and NIWA have to explain WHY application of R&S93 does NOT replicate NIWA’s results when R&S93 is published, established, methodology. And they have to provide solid scientific and statistical justification (i.e. the published methodology) for NIWA’s departure from the established R&S93 methodology that they point to in their Review. In addition, what EXACTLY, invalidates application of R&S93 as the Trust has done? If the Trust’s application of R&S93 is valid then it’s a valid series and a valid trend – period. No. The whole point of the Audit exercise was to determine whether NIWA’s application of R&S93 methodology was correct. BTW, BOM didn’t do a technical audit of the method application in its review. Comment RT? You know you want to. I should have explained earlier: I’m on a road trip with my wife and a son. It’s been great: I’ve driven about 3100 km of the North Island since January 11. Jim’s article was posted only today so I have had little time to review it, but what a story! He distorts the truth and his ego gets in the way all over the place. It’s incorrect that the Coalition didn’t contact him. There were countless requests over many years to share his data and methods with scientists in the Coalition. He always refused. We don’t know why (you might like to ask him). When we asked NIWA what adjustments they had made (because they weren’t listed on their web site) they didn’t give us a straight answer. Of course we didn’t ask Salinger — he didn’t even work for NIWA. They had just fired him. Did NIWA perhaps ask him? If not, why not? Everything Jim says is soaked in his over-sized ego. We didn’t know what adjustments had been made, so we didn’t ask why NIWA made adjustments, it was more fundamental than that: we needed to know what the adjustments were! They refused to tell us. Eventually it was obvious they had no idea what had been done, so they were forced to reconstruct the whole record. It was a scientifically sound decision, but they used an unpublished, unproven method. Maybe you could elucidate on the linkages with the International Climate Science Coalition and the names of the reviewers who ‘validated’ the NZCSET calculations. The ICSC: our connection is hardly relevant, as the ICSC wasn’t involved with the court challenge, but it’s no secret we cooperate in the fight to publicise the truth about the climate. The reviewers: I don’t know their names, just as I don’t know the names of any scientific reviewers. For good reasons, it’s common practice not to publish their names with the paper they review. On the audit: the NZ temperature record doesn’t have to match any other record, so I don’t know why you bring up BEST or the “South Pacific” as though they somehow confirm the truth of the 7SS. Richard C has given you pretty good answers there, although you’ve traipsed merrily after wild geese. The single important issue is whether the method used was good, and our audit showed the results of using R&S properly — over the last hundred years, the country warmed at a third the rate NIWA claims, and only half the rate of the rest of the world. I don’t know why Wratt suggests a dramatic change to the proper method, but in doing so he confirms again that NIWA is not using it as defined by R&S93. There’s more to say, but that’ll do for now. Happy cruising RT. We live in a marvelous part of the world. Yes, we’re not reading Salinger-the-scientist at the ABC’s warmist enclave The Conversation, we’re reading Salinger-the-activist and Salinger-the-bluffer. He knows his target audience wont fact-check and don’t understand enough of the issues to do so anyway. So he’s just spreading enough untruth to smear knowing no-one in the media will take him to task and ask for proof of his allegation – least of all the ABC. Thing is, unless he can itemize all the “errors” in his “instead making lots of errors” claim (not one of which was given for NIWA’s court defense) we’re really reading Salinger-the-liar. His claim is redirection anyway (i.e. he’s firefighting) because as the Audit revealed it was NIWA that was “instead making lots of errors” in respect to the established methodology. If not “errors” then unsupported deviations. Defamation—also called calumny, vilification, or traducement—is the communication of a false statement that harms the reputation of an individual, business, product, group, government, religion, or nation. Lucky for Salinger that the Trust was wound up. We sure do. I love driving hundreds of kilometres and finding people who smile and say “gidday”. I love gliding through pristine wilderness on a comfortable road hundreds of dizzy feet above a glistening river I’ve never seen and never will again. We’ve spent too much money, a lot of it on food we haven’t prepared. We’ve eaten more that’s bad for us than is good for us but we’ve all got on tremendously and we’re happy though it’s nearly over. Back home from the north tomorrow. J Venning cannot have read the ‘Statistical Audit’ and ‘Supplementary Information’ (the KEY matter “the Trust refers to and relies upon to support its argument”) because if he had he would have seen that actual application of RS93 is neither “ambiguous” nor “equivocal”. It was the Trust that applied RS93 faithfully but NIWA that, although RS93 being their “basis”, actually departed from it (see below) thereby introducing the ambiguity and equivocalness. Dr Wratt states explicitly that “[RS93] form the basis (with annual updates for new data) for the [7SS] used by NIWA between 1992 and mid-2010”. Basis yes, but they didn’t adhere to it as the Trust did. NIWA deviated from it (“departing from it” as Venning puts it – see below) without reason or support from any citation (and they still haven’t produced that either, even now). So the Court is faced with a conflict between the direct evidence of Dr Wratt and Dr Mullan that the adjustments applied by NIWA to produce the homogenised 7SS series utilised the methods documented in RS93, and the indirect material relied on by the Trust. J Venning doesn’t mention that the Trust actually applied the RS93 methods in an exhaustive audit document presented to the court (i.e. not trivial material) and the methods produced a different result to NIWA’s. In other words, Wratt and Mullen were economical with the truth and the Judge bought it. J Venning couldn’t get to grips with what he was being led to believe. NIWA actually acknowledges that it didn’t apply RS93 in testing the 7SS but Venning takes that to mean they must have applied it in the first place. Mr Smith made two other relevant points that provide further support for NIWA’s position. Dr Salinger was NIWA’s employee from 1992 onwards. RS93 was developed and published during his employment with NIWA. It is extremely unlikely that NIWA would have funded Dr Salinger’s work which led to RS93 at the expense of other work yet at the same time would still choose to apply an outdated version of Dr Salinger’s methodology to the 7SS. Finally, as NIWA acknowledges, when testing the 7SS it did not apply the RS93 methodology. Why would NIWA expressly acknowledge departing from RS93 and applying different technology if, indeed, it had not applied it in the first instance? Venning didn’t find the answer to his own question i.e. his investigation was incomplete. He didn’t refer to the ‘Statistical Audit’ and its SI which demonstrates that in the first instance, sure, NIWA didn’t apply a “different technology” – no dispute, but that they had applied their unsupported variation of RS93 – not RS93 as originally documented. Obviously they could not apply RS93 when testing the 7SS because if they did they would have just got the same result the Trust did. Nice work, RC. Interesting read. You expose the cleverness of NIWA’s deception of the Court. Clarifying last paragraph (a bit woolly there). NiWA didn’t depart from RS93 to a different technology entirely in compiling the 7SS but they did depart from their statistical RS93 “basis” as the ‘Statistical Audit’ proves i.e. they deviated from RS93 – a subtle difference to departing entirely from it which Venning didn’t identify. NIWA did depart from RS93 to different technology entirely in testing the 7SS (i.e. non-statistical testing). Obviously they couldn’t apply a strict RS93 statistical test because it would return a contrary result to their variation on RS93 as the Trust audit found. This logic could be expected from a lay person but not from a judge who should have a rather more penetratibg mind. It is a seductive argument on the face of it but a does not necessarily prove b in this case i.e. there is an apparent connection between premise and conclusion but not an actual connection. Venning’s argument is in fact a non sequitur. Venning’s failure of logic stems from his failure to identify the disconnection between his premise and his conclusion. The disconnection is that although NIWA used RS93 as a basis for their method, they didn’t actually apply that method as-is. They actually applied their own variation of it. Obviously one is not the same as the other and therefore the disconnection. That is not to say that such a method cannot be varied. For example BOM applied a variation of MW09 to compile ACORN-SAT in order to transfer the method from US application to AU application. NZ application of MW09 would require radical variation because, for starters, MW09 requires 100 neighbouring stations for comparison from which 47 (I think it is) are selected. This would be impossible in NZ because it is difficult finding 4 – 7 let alone 47, and certainly not 100. The neighbouring station comparison principle still applies in MW09 as in RS93 however, which NIWA doesn’t adhere to. But the Trust demonstrated that variation from RS93 is both unnecessary and unwarranted in order to compile the 7SS, and produces a much different result than adherence to it as-is does. NIWA’s method (a variation of RS93) has a modicum of validity but nowhere near the validity of the Trust’s unvaried RS93 method. Morgan, Wratt and Mullan can give all manner of reasons why NIWA should have license to vary RS93 but all those reasons in no way invalidate the Trusts unvaried RS93 method. In short, even after Venning’s judgment, NIWA still has the unvaried and valid application of RS93 to confront because J Venning mistook NIWA’s method to be unvaried RS93 when it was clearly a variation and he didn’t address the Trust’s unvaried application of RS93 in the ‘Statistical Audit’ and its SI anyway. Consequently, the likes of Salinger will do their utmost to vilify the ‘Statistical Audit’ because it’s still in their faces i.e. it hasn’t gone away and is still a major problem for them. 1) Application of unvaried RS93 rather than varied RS93 is incorrect (“errors” are made by doing so), but application of varied RS93 rather than unvaried RS93 is correct. This is a preposterous claim that cannot be reasoned true by any intelligent person and I’m reluctant to think Salinger is actually claiming this but it has to a possibility at least..
2) The Trust violated RS93 method in their application of it (made “errors”) irrespective of approach (unvaried RS93 in the Trust’s case). And according to him “lots” of violations (“errors”). I’m inclined to think this is what Salinger means by his claim and it is a claim that can easily be proved either: true, simply by itemizing each violation of RS93 in the ‘Statistical Audit’ and its Supplementary Information if such violations do in fact exist, or, untrue if no such violations exist. Given 2) probably represents Salinger’s claim best, I’m looking forward to seeing Salinger’s proof of claim, or otherwise. If you calculate that NZ has risen by only 0.3C/century then you have done something wrong. NZ’s temperature has risen by more than that. I suspect your sampling methodology was wrong; correlations are much poorer at daily/monthly intervals than annual due to micro-climate influences. It wouldn’t surprise me if there were computational errors as well which the unnamed reviewers would have picked up. Really? The Trust uplifted EXACTLY the same raw data from the CliFlo database that NIWA uplifted. See pages 6 and 7, Appendix A p. 31 and Appendix B p.33. Well, rather than be surprised, why don’t you actually look at both the ‘Statistical Audit’ and its ‘Supplementary Information’ (both linked in comment above) and show us all the “computational errors” you think are in them? That would be a huge assistance for everyone – thanks in advance Simon. If you are referring to comparison site selection, RS93 stipulates “neighbouring” stations. The Trust applied unvaried RS93 i.e. “neighbouring” stations. NIWA applied varied RS93 i.e. they include “remote” sites in their sample selection of comparison stations. So whose sampling methodology was wrong again Simon? Suggest you make Masterton a case study Simon. It’s a relatively straight forward location, no UHI problems for example. You’ll soon see why you’ve gained that mistaken impression. The RS93 method applied by the Trust produces no adjustments at any of the site changes over the entire location series i.e. the raw data remains unchanged. The Trust’s overall trend for seven stations is 0.34 °C/century, no different than Masterton individually. NOW do you see why NIWA’s aberration is so contentious Simon? NZ’s temperature has risen by more than [0.3°C/century]. Unless BEST is wrong too? Maybe you should take them to court. And the irony is that this was initially funded by the Koch brothers. Could be, either BEST or NIWA is wrong in respect to each other. NIWA’s mean for the last 5 years is 13 C but BEST 2000s is stuck on 11 C – a 2 C discrepancy. Similar in the 1920s when both BEST and NIWA had 7 stations on mainland NZ. NIWA’s 1920s mean 11.9 C but BEST about 10 3 C – a 1.6 C discrepancy back then (i.e. the discrepancy has widened since – why?). Someone is telling porkies Simon. Who do you think it is, BEST or NIWA? Turns out that NIWA’s measured temperatures for Dunedin average out at 11.16 C over 2001 – 2010. That is unadjusted because it is the most recent data at the current Dunedin reference station Site 6 Musselburgh EWS4 in use from Sep 1997 to present. Dunedin at 11.16 C is just a little HIGHER than BEST’s last moving average level of just under 11 C for the entire New Zealand mainlaind including the North Island. So yes Simon, BEST is wrong too. This must be very embarrassing for you. A pity they all forked out for a dud. Honestly, we just go around in circles. I have tried to explain this to you before but you never seem to get it. What is the average temperature of NZ? 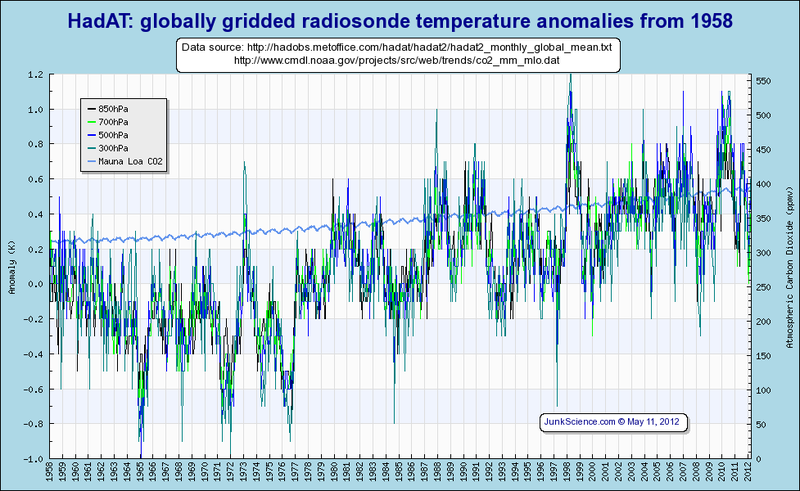 It is not simple to estimate, which is why it is more usual to compare temperature anomalies. The average of a set of stations is not the same as the country’s average. BEST interpolates through a kriging algorithm that uses altitude as a variable. It is not surprising that it is 2C less. There are a lot of mountains in NZ, in places where NIWA does not put weather stations. No-one is telling porkies Richard, you just don’t understand what you are comparing. And after kriging, the typical climatic temperature of New Zea;land that most people experience, especially for farming and agriculture, is represented by locations on a latitude somewhere south of Dunedin – like Gore, or Invercargill? Or somewhere at altitude – like a kilometre above the Canterbury Plains, or the Waikato? I don’t think so. The BEST system produces meaningless made-up fiction of no use to anyone. Needless to say, it has not been adopted as one of the “main” series (see below). The BEST increase is about 0.65 C but the HadCRUT4 increase is only about 0.35 C at most. The 1998 El Nino is most pronounced in HadCRUT4 and HadAT but all but disappears in BEST. Evidence for a pause in global warming shows up in all five of the main global temperature datasets although the exact start of the pause varies depending on the set of data that is used. The five datasets are those maintained by NASA, NOAA and the Met Office as well as the two datasets that rely on satellite measurements and are mainatained by US firm remote Sensing Systems (RSS) and by the University of Alabama in Huntsville (UAH). BEST conspicuous by its absence in “the main global temperature datasets”. I think we have an outlier. BEST is not a series of measurements, it is an interpolation and analysis of them. You are not comparing apples with apples. How can you spend all this time looking at data without understanding what it means and where it comes from? Even over a common period all ending at 2010, BEST is still an outlier. BEST is probably giving more weighting to inhospitable, lower populated areas (e.g Greenland) which also happen to be warming faster. The important thing is that all metrics are showing a statistically significant warming trend. I am Simon. I’m comparing useful apples to useful apples. BEST’s 11 C representation of current New Zealand temperature doesn’t relate to any useful or realistic situation. Yes there will be places at altitude and places at the bottom of the South Island that will exhibit an annual 11 C mean but that is useless and unrealistic as a representation of New Zealand.temperature as a whole. But 13 C is useful, realistic, and is what gets published. 2013 was published as 13.4 C for example, not 11 C or thereabouts. I know that perfectly well Simon. But the input data is the same sample data that can be accessed by anyone else including NIWA, and NIWA had a similar product to BEST out before BEST (you can buy it commercially) but that is not used for the purpose the 7SS is. BEST currently accesses 33 NZ stations and NIWA could have done so too by adding to the initial 7 over time (actually only 1 initially), but they didn’t. They (actually Salinger – see below)) have settled on 7 specific sites most of which can form a “long-running” series (the full 7SS only actually starts at 1913) as a sample representative of NZ climate i.e. selection of the 7 locations is specifically for: quality control, a long running series, and geographical representation. landscape, the variations from year to year were much more spatially uniform, and only a few locations were actually required to form a robust estimate of the national temperature anomaly. For such a small land mass only one or two locations would probably suffice but the 7SS concept is sound i.e. it is fit for purpose in terms of: quality control, sampling, and length of series. The problem however, as we’ve seen from the Audit of the 7SS, is that the quality of NIWA’s homogenistion has been substandard in terms of the established standard specific to NZ i.e. RS93. So in the case of Auckland, BEST confirms the Trust’s RS93 trend but dis-confirms NIWA’s. Still enthusiastic about BEST Simon? And statistically significant flatlining. Those trends from 1979 are getting progressively lower each year now because of the flatlining. Warming only actually occurred 1979 – 2000ish, there’s been no statistically significant warming for over 17 years (HadCRUT4). Similar in the 7SS. Every year now just confirms the flatlining as I quoted from reportingclimatescience.com above. The IPCC’s anthro attribution period is 6 decades 1951 – 2010 but warming only occurred in 2 of those decades 1980 – 2000. That’s only 20 years of warming and even that is now being increasingly attributed largely to natural variation. Okay, what are the apples then? There is basically one common variety plus a second that I can identify. The recent 7SS 13 C is a typical near-sea-level temperature that would be expected at the geo-spatial centre of NZ which is somewhere up the mountains just south of Nelson (or wherever the 7SS geo-centre actually is), but when the altitude of that geo-centre is also at near-sea-level. In other words, when all of mainland New Zealand is concentrated at its geo-centre and at near-sea-level then the temperature is around 13 C.
As for the 7SS above, The recent BEST NZ 11 C is the typical temperature at the geo-centre of NZ except at the specific altitude that all of the (mostly interpolated) grid points reduce to when averaged. Unless that altitude is stated the 11 C has no meaning, and even when stated it has been arrived at mostly by made up, unverified data. BEST doesn’t state the altitude that I know of. The recent BEST NZ 11 C can also considered to be a temperature contour (isotherm) corresponding to a horizontal terrain contour at the specific altitude that all of the (mostly interpolated) grid points reduce to when averaged. Again, unless that altitude is stated the 11 C has no meaning, and even when stated it has been arrived at mostly by made up, unverified data and BEST doesn’t state the altitude that I know of. However, the NZ thermal gradient is warm to cool north to south so the actual 11 C isotherm will not be horizontal, it will instead be at a higher altitude in the north than in the south so this variety is somewhat problematic. Given most NZ habitation and agriculture (except hill country sheep and cattle) and horticulture would probably (we don’t know if they don’t state it) be below BEST’s typical altitude i.e. nearer to sea level than to that altitude, then it’s not a particularly useful metric and especially not when it’s not stated. Except that the satellites also cover those areas and their trend is no different to HadCRUT or GISTEMP. The BEST method is somehow introducing extraneous warming globally in the satellite era and regionally going back further e.g. the SH since 1940 (almost double HadCRUT4). When are you and your cronies going to pay the costs that you have levelled on the taxpayers? Treadgold, you are a fraudster, and you will be made to pay for your sins. You’re right, it doesn’t respond to Salinger, but my comment here at January 23, 2014 at 11:34 pm does—could he be referring to that? Could you post a link to his comment? UPDATE: Ah, link not needed, I see his post. Nasty. In response to your question: He refers to my “comment”, although he also refers ambiguously to the post. I’m having to restrain myself, his vitriol spills all over the place. Cheers. I see it. Lucky me, in the news/gossip/slander again! Where do I start? I’m trying to earn a living here! Heh, heh. When you stop hiding behind a false email address you might get an answer, weakling. You spineless worm, you should know everyone pays for their sins. But please specify my “fraud” so that I don’t apologise for the wrong one. Thanks. Personally I’m hoping (against hope) to get the money back that has been extorted from me via the ETS after the world has failed to warm in 17 yrs and the tropospheric hotspot has failed to materialise in over 40 yrs. I wonder where the citizens of the world will be able to reclaim all the money stolen from them now that AGW has failed all the empirical tests. Perhaps the warmists who promoted it like ctg can refund us all, or maybe the good folk at NIWA who are so afraid of their scientific methods they don’t want anyone to know what they are (that’s on the assumption they actually have any methods). Since they continue to believe in AGW so much (contrary to the peer-reviewed empirical evidence) perhaps they’d like to continue their financial contributions when everyone else is eventually let off the hook like in Australia. How much money has been stolen from the world in the name of AGW? Trillions? Maybe you should calculate how much money you have been supposedly extorted of in this toothless version of an ETS that we have. It’s a zero-sum game so there are benefits as well as losses. Remember that you, through the Government, are a shareholder in all SOEs. Mere pocket-money, unless you’ve been doing some large scale farm woodlot deforestation. If I did calculate it SimonP would you refund me? The govt needs to get rid of the ETS completely until some evidence for AGW appears. Taking money out of my pocket to spend on misguided govt policy isn’t a zero-sum game to me as I’m out of pocket – I have better uses for it than having someone else flush it down the toilet. When the UN finally admit defeat on AGW (and it’s not too far off now), how do you suggest they reimburse everyone? Even if AGW is “real and dangerous”, there is no evidence that an ETS would make any difference to emissions anyway. It seems like a very good way to firehose money from the public into corporate forestry though. If the price is so low and nobody is affected by it then the ETS may as well be canned. It didn’t serve any purpose under Labour when it’s cost was higher and it doesn’t serve any purpose now under National. It fails totally in it’s supposed aim to reduce CO2 output, not that CO2 is much of a problem without positive feedback from water vapour as proven by the empirical evidence of a missing tropospheric hotspot. It’s nothing but a revenue gathering exercise to keep the socialist wealth re-distributors in Europe happy so we can continue to trade with them, all as the global temperature still stubbornly refuses to rise for at least the last 17 yrs in a row. But the global climate really isn’t continuing to warm at the 1980 – 2000 rate is it? 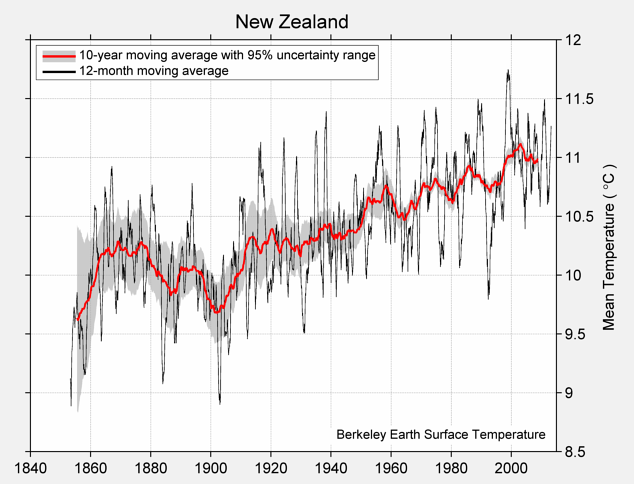 And the NZ climate really isn’t warming at all in accordance with NIWA’s projections is it? And global climate really isn’t warming at the rate of the CMIP5 GCM projections is it? In fact, in view of the statistical insignificance, you could say it’s really at a standstill, or a pause if you will, warming or cooling – take your pick. The statistically significant warming ended years ago. Mark Serraze pointed out at RC that there were rather more thermometers in the Arctic, including ocean floats, than Stefan or C&W were letting on. What he didn’t say was that the made up “data” of GISS and C&W could be verified, or not, by comparing actual data with extrapolated or kriged “data” at the specific measurement locations available that had not been used as input. Hopefully someday someone will do that V&V. In other words, kriging must be fixed or calibrated to actual measurements at OUTPUT as well as input. If the output doesn’t match actual measurements at the measurement location then the kriging output is rubbish even if actual measurements are used as input. There’s a warmist at Jennifer Marohasy’s who is big on “the enhanced hydrological cycle” – poor fellow. I really can’t see how people can cling to the AGW theory without dealing with this problem. I raised it with Gareth in the most polite manner I possibly could and he side stepped and then ignored the question – how can he believe in & promote AGW when the main part of his theory is thoroughly discredited by multiple sources of empirical evidence? How can it warm dangerously without positive feedback from water vapour? I think they’re either raving socialists who don’t care and have highjacked the issue for their own agenda, or are just too weak to admit that they’ve make a mistake – they’re dishonest either way. I hope as many as possible of those who promoted AGW for financial gain get taken to the cleaners for fraud. It’s one thing to be in error and to acknowledge it, but it’s another thing entirely to know your error but continue fraudulently for financial gain anyway. They should start with those who misrepresent the science of Working Group I when they wrote the Summary for Policymakers at the IPCC. So the IPCC and the Met Office are wrong then? 17 years was Ben Santer’s criteria, time has caught up with him in the case of RSS. The “no warming” depends on the dataset and whether the “no warming” is just flat or statistically significant. 17 years of “no warming” is true for “flat” in RSS but not true for GISS, HadCRUT4, and UAH. 17 years of “no warming” is true for “statistically significant” in UAH, RSS, and HadCRUT4 but not true for GISS. Forget the 1998 El Nino year Simon, it isn’t “chosen” at all in the list above. So in the case of RSS at least, human effects better start showing up from now on according to Santer et al. Or in other words, the requirement for 17 years at least is Santer’s argument and in the case of RSS the criteria has now been satisfied. In any case, 17 years was never the sceptics argument. It was Santer’s and the sceptics are just monitoring progress on the criteria i.e. accountability. Let me try and explain this more simply. The noisier the data, the more data you need to prove something. The inability to prove statistically significant warming does not mean that warming is not occurring. Take a look at the confidence intervals you have provided. They are all positively skewed. That means that warming is occurring but it can’t be proven to a 95% CI. You need more data points. Add a few more years and voila, the warming is statistically significant. The argument is total BS that anyone who has done a first year stats course should be able to see through. Simon, you make a good point, statistically speaking. Still, if we can refer to the past 17 or so years as a “lack of warming,” there’s a far more important argument to be made from it. Well, two arguments. 1. The models did not predict it. No matter how their supporters bluster and puff, the models have been widely cited as predicting “more and more” warming until the earth practically bursts into flame. Nobody mentioned the occasional pause would occur for us to catch our breath. 2. For the predictions to be fulfilled, warming from now on must be at impossible rates, therefore the modelled predictions are wrong and we can all go home. If the data are so noisy that you can’t show that warming has “stopped”, then can you use the same data to show that warming is occurring? Exactly. Thank you, now we are getting somewhere. This is Santer’s argument. He is saying that less than 17 years is not enough data to prove human effects are occurring, or otherwise. More than 17 years is needed. So now we DO have a trend centred on 0 (flat) in one dataset at least (RSS) for 17 years and we have to go back to 23 years for statistically significant warming in RSS (1.968 upper bound). But it could also be cooling (-0.005 lower bound). Or not, that is now the test that AGW is under. For RSS we have a commencement point (November 1996), addition of 2014, 2015, 2016 etc MUST now produce statistically significant warming for AGW to be verified (or not) according to Santer’s criteria. Warmer, corresponding to CO2 forcing which although the IPCC’s CMIP5/AR5 CO2-forced climate models indicate 0.33 C/decade over the next 20 years, the IPCC’s downgraded AR5 prediction by “expert opinion” (a guess) is 0.23 C/decade. Their lower bound is 0.1 C/decade which is impossible to be identified as anthropogenic apart from natural variation or noise. 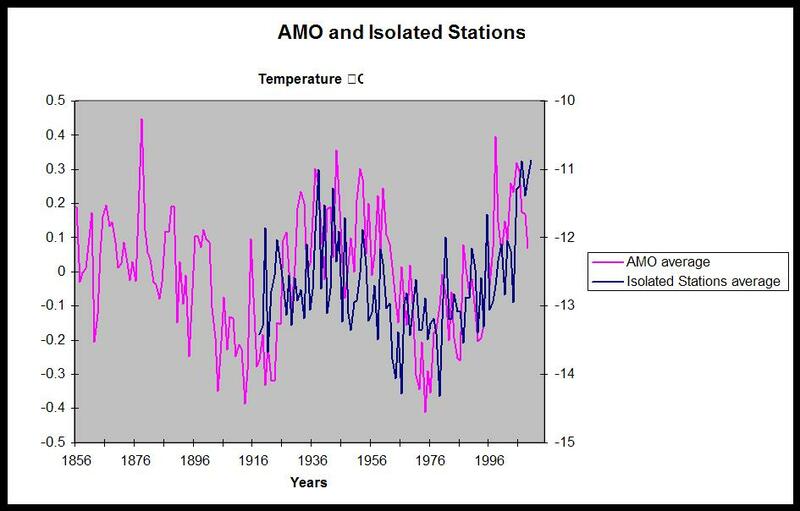 The CSIRO wimps should be betting on 0.33 C/decade or 0.66 C warmer than now in 20 years time (i.e. Scenario 1) if they really are convinced their rationale and modeling are to be relied on by everyone else. No change. A climate regime similar to now from which any of anthropogenic, solar, PDO/AMO, aerosols etc cannot be isolated individually. Obviously this would include warmer but less than Scenario 1) and cooler but more than Scenario 3) below. The global climate regime has been Scenario 2) so far this century. Cooler, as a combination of negative phase ocean oscillations (PDO/AMO) and lower solar output. The negative phases of the ocean oscillations have about 20 years to run (PDO) and 30 years to run (AMO) from now respectively. The negative phase of the solar cycle has about 200 years to run from its 1950 – 2009 peak. -0.008 ±0.200 °C/decade (2σ) last 17 years. Target 0.23 C/decade or 0.33 C/decade – a long way to go for AGW verification by RSS then.